This kit comes with all the components and instructions required to replace a damaged insert within a tank and is a simple task but will need to be carried out by a competent service engineer. 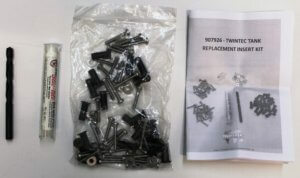 To order this kit please use part number 907926 TWINTEC TANK REPLACEMENT INSERT KIT. For any questions relating to this kit please contact the Numatic technical team.